This is probably the single most important Christmas decoration of all, though of course it's not a single thing, because it wouldn't really be a Christmas tree without all the various ornaments and lights and things that we put on it. Anyway, we've always had a live tree at my parents' house, and my grandparents' house. For several years I shared a series of small apartments with my sister, when we were away from our hometown, and she had at least one or two fake Christmas trees over the years. One of the most important decorations on a tree is the topper, and there's always the question of whether to top it with a star or an angel (which may or may not light up). I'm sure we've done both, in my family, on different years. (And some people may use other kinds of toppers.) And there are all different kinds of light strings... single color vs. multicolor, large bulb vs. small, blinking vs. steady, etc. Yeah, we've done lots of different things. As far as lights go, probably our favorite kind is bubble lights. Mostly these have been on strings, on the tree, but also we've had some single bubble lights that just plug directly into wall outlets, and they may have some additional decoration attached, like a little Santa clinging to the light, or something. I'm also quite fond of icicle-shaped lights. Anyway... there are lots of other decorations to mention below, some of which are tree decorations and some stand-alone. This stuff that comes in spray cans, which can be used on Christmas trees or windows. Or other things, maybe. If you're going to spray it on windows, that often involves stencils to make designs such as snowflakes. But it's been many years since I've used fake snow. At some point I may have thought it was a neat idea, but I think I ended up not really liking it in practice as much as in concept. These things were pretty common, when I was a kid, but I don't recall seeing them for quite a few years. (Of course, we had some for pretty much every holiday.) Just cardboard shapes with pictures on them, like Santa or any number of other things, which you'd tape or tack to the wall. They might be double-sided, so you could hang them in a window or from the ceiling or wherever. Pretty much what it sounds like: a tabletop ceramic evergreen tree. The branch points have holes for little different-colored pegs which are mostly Christmas bulb-shaped, but also things like birds, and a star at the top. And there's a light inside that lights up all the pegs. (Or in some cases the pegs themselves may actually be individual mini-light bulbs.) The whole thing is quite nostalgic, and luckily my grandmother still has one on display every Christmas season. A lot of people have major light displays, often arranged as sculptures, though I don't really think my family has ever gone that far. But it's fun sometimes to see random Christmas displays at other people's houses (or businesses) while driving by. And in some places there may be whole communities with tons of displays that become like actual destinations to drive by, specifically to view the displays. There are a practically infinite varieties of ornaments to be hung on Christmas trees. They can include candy canes (real or fake, but preferably real, because you can eat them when you're done using them as decorations), or various other foods (usually fake). They can include all sorts of animals (especially birds, bears, or reindeer, or if you're Swedish, dala horses). They can include angels, bells (real or fake), pinecones, pleated hearts, Santas, sleighs and sleds, snowflakes, snowmen, candles (preferably fake, so as not to start fires, but before the advent of electric lights, real candles were more common, which blows my mind). They can include... like I said, infinite different things. Even licensed products from whatever entertainment or corporate franchise you may be into (like Coca-Cola, Star Trek, Star Wars, Tinker Bell, My Little Pony, et al.) But I think the very most common kind of Christmas tree ornaments are baubles (or ball ornaments). Yes, after the lights and topper, baubles are the most important kind of tree decoration. They're like the pepperoni of ornaments. I've had a number of these over the years, at least one of which was probably hand-knit from yarn, or whatever (by one of my older relatives, though I don't remember who). But also I've had various store-bought ones. 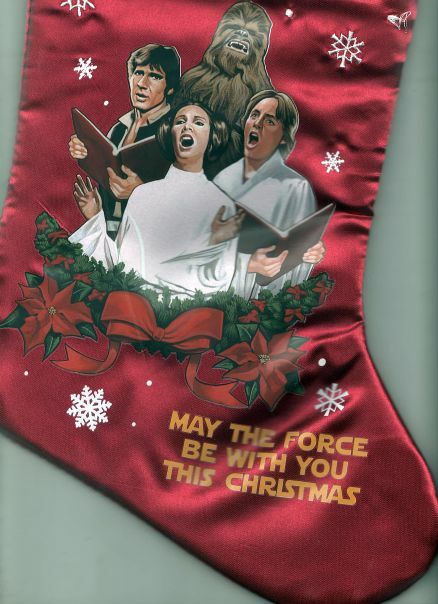 In 2014, I bought myself a Star Wars stocking, though so far I haven't actually used it. And of course, stockings are more than just decorations, they're also functional, in the sense of getting small gifts in them. Which is awesome. We never really had a chimney to hang them by with care, so usually they'd be hung on staircase railings (which also had garland wound around them). Oh, but some stockings really are just decorative. 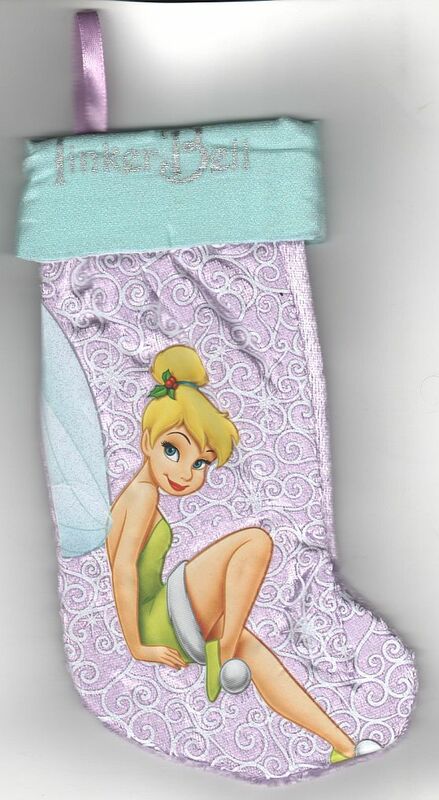 For example, one year I bought myself a Tinker Bell stocking, which is too small to bother putting presents in (though I suppose you could fit something in it, if you really wanted to). There are many types of figurines one might have for Christmas. Things like elves, or Santa, or reindeer & sleigh, or trees, or Nativity scenes, a Christmas village, etc. In 2014, I got a Tinker Bell figurine, which I ordered from Disney Movie Rewards. And... I might have some other kinds of figurines, I don't really remember at the moment. I'm sure we had some of these things... they start out flat, because like, there's these two pieces of cardboard, but you open them out and tissue paper expands into 3-D shapes like Santa or a snowman or bells or a Christmas tree or whatever. This is something we've occasionally had on Christmas trees, usually of the tinsel variety. It can also be strung up pretty much anywhere, inside or out, and usually that would be of the evergreen variety (though usually plastic rather than real). And sometimes that can be intertwined with light strings. I also think we must have had popcorn garland at some point, but that's often more trouble than it's worth. A plant commonly used in wreaths or other decorations, but I'm mostly used to seeing pictures or drawings of holly, on things like Christmas cards, websites, etc. It's also half of the song "The Holly and the Ivy," though I'm not aware of having seen or heard of ivy used as a Christmas decoration, outside of the song itself. Anyway, I do like holly; in fact, you'll notice some at the bottom of the front page of my Winter Holidays section. When I was a kid, we had hollow plastic figures of things like Santa Claus or a snowman, which had light bulbs inside. I suppose we normally put those in the windows, but they could be used anywhere. And we also had such things for Halloween, like a plastic pumpkin or witch or whatever. Of course, other people may have any number of different types of illuminated figures, not necessarily plastic or even hollow. I'm not really familiar with those things, though I'm sure I must have seen them somewhere. These are mostly for lawns, I guess, though I don't remember ever seeing any in person, let alone me or my family using them. The only place it comes to mind that I've actually seen such things on display is in the mall. Which is not to say I have anything against them. Maybe someday I will get some such things, myself. This is a type of decoration I'm sure we had some of when I was a kid, for Christmas as well as other holidays. I haven't seen anything like this for years, but the thought of it is kind of nostalgic. I am firmly against the use of this plant as a decoration. Or rather, I'm firmly against the whole "kissing under the mistletoe" thing. It's all well and good if you're kissing someone you're in a relationship with, but you can do that without mistletoe as an excuse. Besides which, mistletoe is sort of a public thing, and I'm also against public displays of affection, in general. But what's worse is people who are not in a relationship using mistletoe as an excuse to kiss someone. This may be small, indoor decorations that you have on like a mantel or whatever, or they can be larger outdoor scenes. I don't have any specific memories of either variety, in my own experience, though I'm sure I've seen some in person. To me this is more something you see on TV or whatever, but it is pretty important, because most Christmas decorations are more focused on the secular aspects of the holiday. So it's good to have something that reflects the true meaning of Christmas. I don't really recall if we ever had any of these. One year my sister gave me a St. Patrick's Day nutcracker, but they're much more common as Christmas decorations. Of course, in the olden days, wooden soldier nutcrackers were actually used to crack nuts, but I don't recall ever seeing one that was actually functional. These days if you ever see that type of nutcracker, it'll be a decoration that may have jaw movement similar to the functional ones, but that wouldn't really work for cracking nuts. Anyway, they're pretty neat, if you like old-fashioned decorations. Which I do. This is a flower I've always had a bit of trouble remembering how to spell and/or pronounce. I always remember that the pronunciation is different from the spelling... or at least it can be. The thing is, I kind of recall hearing them called "point-settias," with a "t" that isn't in the spelling... but I'm probably wrong about that. I also remember them being called "poin-settas," without the "i" in the pronunciation. Though I think the i can be pronounced or not. So all this confuses me. But whatevs, they're still nice flowers. I already mentioned electric candles and other things, but there are also decals that stick to windows (or mirrors). Or decorations that hang from suction cups. And I'm probably forgetting any number of other things. This is actually something that I guess is supposed to be burned in a fireplace, but since I've never really been around a fireplace at Christmastime, I've never actually seen that. You can see them on TV on Christmas, and I have a DVD of one. But there's something different with which I'm more familiar... a table centerpiece, a decorated log that is actually a candle holder. My grandmother usually has one of these on the table around Christmastime.